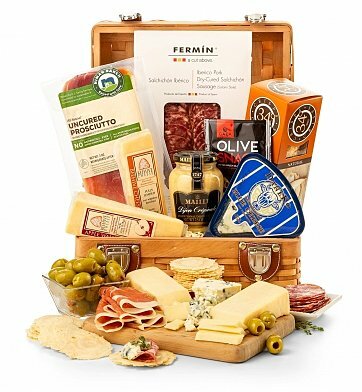 All-natural, salty, creamy Prosciutto from Niman Ranch is joined by Danish blue and smoked apple walnut cheeses, olives and Fermin Salchichon Iberico, crafted from wild pigs who roam the hillsides of the Iberian Peninsula feeding only on acorns. Niman Ranch Prosciutto, Fermin Salchichon Iberico Ham. Danish Blue and Smoked Apple Walnut Cheeses. Green Olives, Maille Dijon Mustard and more. Your gift will leave a lasting impression as they continue to enjoy this enduring keepsake picnic hamper. Measures 14" x 12" x 9". if ordered by 4:00 pm EDT Monday April 29th. Top Shelf Charcuterie and Cheese Basket is a hand delivered gift. These gifts are delivered by one of our local design centers located throughout the United States and Canada. Same day delivery is available for most gifts when ordered before the cutoff time. The cutoff time for Top Shelf Charcuterie and Cheese Basket is 1 PM in the recipient's time zone. Prosciutto, Iberian Ham, Crispbread Crackers and Cheeses. Arrives presentation-ready in a picnic hamper with attached note card.